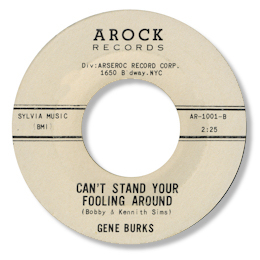 New York artist Gene Burks had just the three 45s out but the sides did include a couple of real gems. His quartet of sides for Arock are better known for the dancers “Shirley Jean” and “Monkey Man” and while the attraction of the latter totally escapes me the former is a pretty good R & B workout with some good baritone sax and blues guitar. For me the pick of the Arock cuts is the deep ballad Can’t Stand Your Fooling Around on which Burks sings up a storm over a very southern sounding band. The song was penned by the Sims Twins. When Ace UK put it out on their “The Arock And Sylvia Soul Story” CD they very kindly ignored the 45 track without mentioning the fact and instead chose a different, longer cut. So obsessives like me can now get to hear two versions – the one you can hear at this website is the original as it was issued. 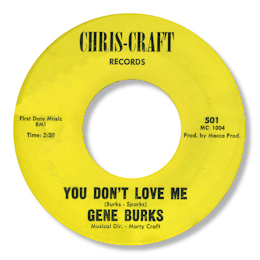 Burks’ other great track is You Don’t Love Me which is so similar and sound to the Arock cuts that it must be the same band – and could even be from the same sessions. His big voice sounds better than ever here and the sensitive lead guitarist gets a special tip of the hat for his licks. Great bluesy finish too. Listening blind you might think this was cut in the deepest south so hard bitten is the arrangement and feel. Chris-Craft was owned by that unsavoury specimen Morty Craft. He sold the master on to a much nastier person in Nate McCalla. Perhaps it would be best to forget about all that and just listen to the music. Note ~ Both "Shirley Jean" and "Can't stand your fooling around" can be found on the Ace UK CD “The Arock And Sylvia Soul Story”.